Here at Petal Talk, we live and breathe flowers in their every form. Whether we’re discovering new ways to decorate with fresh blossoms, creating our own DIY flowers or spotting our favorite blooms in works of art, flowers are what make us smile. So you can imagine the excitement we felt when we came across the newly released book Flower by filmmaker and photographer Andrew Zuckerman. His mesmerizing high-definition images capture flowers in all their glory, creating a vibrant bouquet of photographs that will take your breath away. We were so fascinated by Zuckerman’s flower photography that we just had to reach out to him personally and learn more about his inspiration. Here, Zuckerman himself gives us a behind-the-scenes look at how he brought his latest project to full bloom. Throughout your career, you’ve photographed a variety of subjects: legendary artists, politicians, business and religious leaders, as well as birds and other wild animals. Why did you choose flowers as your most recent subject? My interest in flowers was twofold, really. For one thing, since I began exploring the natural world with Creature, I found myself wanting to create a kind of collection of two-dimensional taxonomy, which I equate most immediately with turn of the century naturalist drawings. Flower was the next step in this process. In addition, I like to work with self-imposed constraints and I tend to be inspired by subjects that have been exhausted. Since flowers are one of the oldest subjects in art (their appearance dates back to ancient Egypt), they presented a unique challenge. I was really interested in divorcing the flowers from all their symbolic and metaphorical associations, as well as their ecological contexts, in order to reveal their essential qualities. 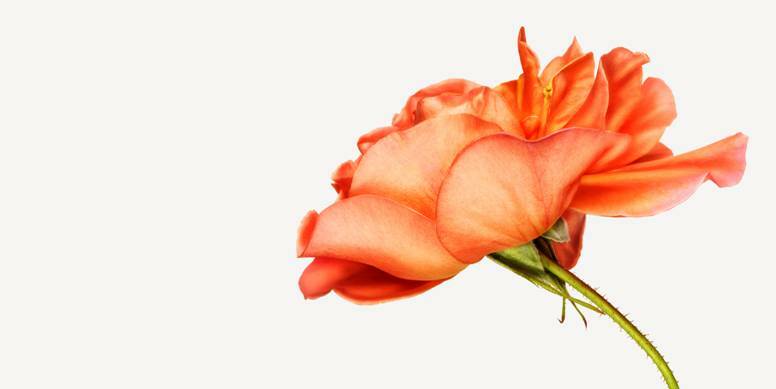 In your book Flower, you show intimate close-ups of 150 flower species. How many flower species did you shoot in total while working on the book? How did you select the final 150 images? I shot around 250 species in total, all of which are included on the project’s microsite, FlowerTheBook.com. I like to be pretty comprehensive once I start investigating a subject, and I work across a few platforms to create more points of entry into the work. So the projects will include films, a website, taxonomical index, and of course the book, which I consider as an object, so how all the images work together and flow from page to page is important. I usually start with my favorite images and go from there, making sure every image makes sense as part of the larger whole. The bright colors of your flowers set against a sharp white background give your photos a surreal effect, putting an intense focus on the flowers themselves and nothing else. Why do you shoot your photos this way? I find this reductive approach suits both my taxonomical impulses and my desire to reveal the essence of a subject. Many of the exotic flower species you shot for your book aren’t the kinds of flowers you see every day. How did you collect them for your photo shoots? We were very fortunate to have the support of amazing institutions like the New York Botanical Garden, the Smithsonian Institute, and Fairchild Tropical Garden. But I wanted the project to be a broad survey of the botanical world, so you’ll find a lot of New York City deli flowers mixed in with the incredibly rare orchids and tropicals. Working at 1-800-Flowers, we know how delicate flowers are and how carefully they need to be handled. What would you say was the most difficult thing about working with such a perishable item? I was actually surprised by how resilient they were! We work with very hot lights at the studio (and on location), and I expected the process to be much more delicate than it was. But we also handled them with care. We had coolers and water on hand, and we benefitted from working closely with the horticulturalists at many of the institutions. What was your favorite flower to shoot for this project? Even though it’s not the most visually striking, I found the Darwin’s Star orchid, named for its role in the formulation of Darwin’s theory of evolution, the most fascinating. The bloom has an 11-inch spur, which Darwin posited meant there had to be an insect that existed with an appendage long enough to pollinate it. At the time, none had been discovered and Darwin’s hypothesis was ridiculed. But 40 years later, entomologists discovered a moth with a furled tongue that was four times longer than its body. What was the most important thing you learned about flowers during this project? While compiling the taxonomical index for the project, we learned that botanical classifications are in a state of flux since advances in technology have revolutionized the science of classification. So a lot of plants that were grouped according to visual cues are now being re-identified in terms of their biology. I don’t know that it’s the most important thing I learned about flowers, but it was definitely one of the most interesting. I just think about the custodians of the vast botanical world (endless, really; new species are discovered all the time) collecting and reclassifying all the data. That really blew my mind. Your work is known for being accessible to its audience through multiple points of entry, such as photographs, films, and interactive apps. How did you interlace photography and videography to get up close and personal with flowers? The reason I do films, as well as make photographs, books and websites is because I believe no one medium is best suited to conveying a concept. In the case of Flower, I knew that I wanted to capture the peak, heroic moment in the photographs, but I also wanted to explore the life cycles and rhythms of the flowers, which is so inherent to our emotional response to them. The films allowed me to do that. In this film, you show the life and death of flowers, along with music that is synchronized with their life cycle. Stunning! How did you go about making this film, and what was the artistic goal you wanted to achieve with it? The goal, which is always one of the goals, was to render the subject in the most precise way possible. So instead of using video footage, the films were created from thousands of high-definition stills, which were taken every minute or so on a time delay setting. I was very lucky to collaborate with Jesse Carmichael of Maroon 5, who composed the scores, and I love that the music seems like such a natural extension of the visual aims. What advice would you give to budding flower photographers? It’s not flower photographer-specific, but I would pass on the advice Chuck Close gave me when I was interviewing him for the Wisdom project: “Inspiration is for amateurs. The rest of us just show up and get to work.” I think this is one of the most important things for anyone pursuing a creative life to bear in mind. If you loved Flower, you’ll also enjoy Zuckerman’s other work: Bird, Creature, Music and Wisdom. Visit AndrewZuckerman.com to browse through his entire collection of photos and films.